If you don’t support MARTA Rail expansion, you’re on the wrong side of the tracks! Why is it that we can afford $2.4 billion to add ‘express’ lanes up GA 400 but we can’t make a similar investment in transit? If adding lanes is an attempt to cure congestion, how are those extra lanes that were finished in 2007 looking right about now? We need options not express lanes. Extending the rail line will give us those options. Provide the option that commuters desperately need. Increase Crime – Evidence of significant increases in crime are anecdotal at best and according to a study done on the last MARTA expansion, just plain unfounded. Ruin our Schools – There is no credible evidence that transit impacts school quality. Lower our Property Values – If anything, it will increase property values for the vast majority of properties. Modal Shift – Switching from bus to train at North Springs would be a ridership killer for riders of choice and would handicap the system from the start. Speed – BRT is slower than Rail and this stretch is exactly where you need speed in the system due to the long stretches between stations. Permanence – We used to have a quasi-BRT system in North Fulton and ridership has always been low. Now, those lanes are car lanes during rush hour. Track Record – There are only 5 true BRT systems in the U.S. and only one reaches silver (gold is the best) on the BRT Standard rating system. Do we really think we will build a world class bus system in a region that has stigmatized bus service for decades when no other North American city has been able to achieve that standard? We need to stop kidding ourselves. North Fulton needs rail transit. It is the best option even if it is the most expensive option. I urge you to hop over to the right side of the tracks and support MARTA rail expansion into North Fulton. Support the Red Line… It’s About Time! In all, 2015 was a pretty amazing year for Roswell and much of North Fulton. Walkability was in fact king in 2015 and I think it will continue to drive development in 2016. We saw numerous developments and proposals work their way through the area that enhance walkability. That said, not all change is welcome and there was a clear and expected negative response to a number of projects in 2015. The Riverwalk Village, Vickers Village and Sassafras projects received significant opposition and there was a notable cadre of ground troops that organized a fierce anti-density campaign that was quite successful if not always accurate. This opposition came at an opportune time as our City Council elections occurred just as these three developments were working their way through the process. Fortunate timing and significant legwork by the team that formed around the three winning candidates, Horton, Palermo and Zapata, resulted in a significant shakeup at City Hall. Now, before I get too far, I would like to say my peace on this. I believe Horton, Palermo and Zapata will be fine stewards of our city and I believe they support walkability and building places people love. I do think they collectively have a little to learn on what is necessary to build truly walkable and lovable places. However, it's not rocket science and they will figure it out. Now that I've said that, let's get into the projects. We saw three different site plans for Riverwalk Village in 2015. Each one becoming more and more diluted than its predecessor. Ultimately, the developers pulled the project. We won't see this get realized and we are now poised for another 5+ years of nothing happen on that site. Another great aspect of the plan was the early off ramp idea to get traffic off 400 before Holcomb Bridge and into the planned Riverwalk Village development got killed by GDOT due to 5 mph. RDOT needed it to be 30 mph design speed and GDOT insisted on 35 mph. Another good idea down the drain. Ultimately, Vickers Village had to shrink a bit and couldn't go to four stories. They received approval in November and we will likely see construction start in late spring if things go as planned. As of this writing, a few people are still trying to kill Vickers Village on technicalities which is unfortunate but expected given the amount of opposition this project saw throughout the process. They will need to go to a higher level appeals court though if they want to pursue it further. Who knows, maybe the bid to derail Vickers will work but ultimately something mixed-use and walkable with 3 stories is going to eventually get built on that land and whether you like it or not, that is the right type of development for that spot. An interesting fact on that property is that it has been zoned for 3 story development since the early 1970's. Goulding raped the land and that was shameful. That said, we did get a renovation of a historic home and road connectivity. I'm not sure it's worth the damage to the canopy but what's done is done and I always like to look for the positive. Surprisingly, 109 Goulding, pictured above, is already under contract which says something about Frontdoor's renovation job and their overall project plans given the ~$1.5 million price tag. The single family houses are selling well with all three that are under construction reportedly already sold. We'll see if the townhomes sell as robustly and only time will tell whether the project enhances the neighborhood. Personally, I think 10 years from now, this will grow into a very nice part of downtown Roswell. Revised site plan that removed townhomes and reduced overall density to 3.7 units per acre. We lost out on a very innovative development when Sasafrass died its ugly death. Ultimately, the developers killed the project due to a groundswell of opposition to 'high density' development. The diversity of housing stock and the connectivity it offered were too unique to succeed. I really liked this one because it mixed housing types within the same development which creates much more of a natural neighborhood feel than standard tract home development. I also really liked the fact that it cut one superblock into three smaller blocks and would have improved the walkability of a mostly car dependent area. The Roswell City Walk apartments finished up and are now almost full adding some slightly more affordable housing options to downtown Roswell. There is no arguing the fact that this project is light years better than what was there before. I firmly believe that this project will be the catalyst that drives the redevelopment of the Southern Skillet property. Forrest Commons is wrapping up the foundation of the final building and should be complete and sold out sometime in 2016. Just up the street from Forrest Commons is Hill Street Commons. This project has pretty much wrapped up land preparation and looks ready to start building. The sidewalks around the property look nice and wide and I'm sure the townhomes are going to be high quality. City Green has been pretty much stalled in City Hall and there is some concern that the project may die as many don't think it is a priority of the new council. This would be a huge loss and a massive waste of time and money that has already been invested. More on this in a later post. There was finally some movement on the Roswell Plaza shopping center with the city purchasing the property for $4.8M. No plans have been made yet and there will definitely be some community involvement in the planning and ideation process. To do this right, this will likely require 3-4 stories in areas and it will likely require some element of mixed-use residential over retail. We got a good head fake from the Roswell Antique Market. The owners upped the rent and forced the antique market out. Word on the street is that we will see 24/7 paid parking at $5 a pop and another antique market to meet the insatiable demand for antiques from people willing to pay $5 for parking. So, rest easy Roswell, the most out of place building on Canton St will continue to live on. These guys, Southern Proper Hospitality, did a fantastic job opening up their second location of The Big Ketch. The owners of the building, Flying Pig Capital, spent a lot of time and money purchasing and renovating the property adjacent to Osteria Mattone but did a spectacular renovation on the old home there. They fired up the HPC along the way as expectations weren't aligned to the reality of how much of the original structure needed to be removed in order to pull off this renovation even though they were executing on what was originally approved by the HPC. Ultimately, this was cleared up and the outcome was excellent. City Council inexplicably killed an awesome little mixed use building that would have had 14 apartments over office and retail at the southern end of downtown. Redevelopment of 835 Mimosa and the Dolvin House property on Bulloch was approved but the developer pulled out of the Dolvin project. One very resourceful concerned citizen even got President Carter to pen a letter opposing the development. I'd love to see what was actually communicated to Jimmy about the project but that will probably never come to light. It's too bad because this is exactly the type of smart, responsible infill development that can help preserve and enhance historic properties and districts. View of the proposed Dolvin House project from Bulloch Avenue. Three new homes would have faced Bulloch and two would have been behind these facing inward on a small park that would connect to the sidewalk along 120. A new pizza parlor, Pizzeria Lucca, on Bulloch was approved and that project continues to progress. The old building has been bulldozed and construction will start soon. The owners have ambitious plans to be a world class pizzeria. I'm looking forward to seeing what they cook up. There was a GOD Awful apartment project proposed on South Atlanta St that thankfully was pulled. To say that they didn't understand the area is putting it lightly. The name of the project was South Atlanta Street at Big Creek. They obviously didn't do their research on the name of that section of the creek. There is now a proposal in front of the Historic Preservation Commission to discuss townhomes in this spot instead of the originally proposed townhomes. More to come on this project. Vickery Falls was FINALLY resurrected. They are finishing the townhomes and building the condos with plans to add a retail building along South Atlanta Street. This is a big win as that property has been sitting idle and incomplete for ~7 years. The Village on Pine from Acadia Homes is wrapping up construction. It's nothing special in my opinion and missed several opportunities to enhance walkability in the area. The lame duck council passed an amendment to the UDC that will enhance connectivity for future developments. In a city with fewer than 275 actual city blocks, any extra bit of connectivity added to the network is a plus. This is a big win and will require at least a minimum level of connectivity for new developments. Parkside at Strickland by Brightwater Homes is progressing and five or six of the 14 approved homes have been built. I'm still irked that they didn't create a small block by opening having two entrances but I guess that aforementioned UDC Connectivity Amendment will address that issue for future developments. They did add some great sidewalk and trail components to the project. Not to be confusing, another development with Parkside in the name, is going up on the north end of Canton St. Parkside on Canton will be Townhomes and flats and should start finishing up in mid 2016. Just look at all those no parking signs. The new elementary school has opened to Esther Jackson students while EJE is renovated. The school looks nice if you can get past the 45 no parking signs and the chain link fence that surrounds the entire property. To say that this school missed the walkability boat is putting it lightly. Three new breweries were announced in 2015 and a fourth pulled out. Gate City Brewery took over the old Roswell Automotive spot behind Pastis and will start their buildout and facade renovations soon, assuming the feel like battling the gauntlet the city puts up to renovate anything in the historic district.. yes, even that corrugated metal siding building. Abbey of the Holy Goats is putting the finishing touches on their spot off Old Roswell Road and their tasting room is starting to sound pretty good. Variant Brewing was announced toward the end of 2015 with an expected opening in later 2016. They plan to renovate a building along Norcross Street across from the Smith Plantation property. Steady Hand was a short lived brewer proposal. They proposed a pretty nice building along Green Street just behind the fire station but the application was pulled and I haven't heard the details. The facade at RHS got a much needed upgrade in 2015. I'm not sure if that had anything to do with the Hornets' march to the 6A football championship game but well designed architecture actually does impact one's state of mind. I'm not sure why this property owner felt the need to do this but.. they did it. What was a previously open walking path was fenced off and closed to anyone wanting to take an easy trek to Thumbs Up, Lucky's, Pure or even the bus stop. Whoever decided that was a good idea gets the Walkability Grinch award. One of the most interesting development addresses in all of Roswell got started with land clearing in late 2015. Being sandwiched between a watertower and a cemetery makes for giving easy directions to friends and visitors. This project received city council approval but I think there was a big miss from a connectivity standpoint. But, it is definitely a good example of smart, responsible infill development that will update an empty historic building while adding homes behind it. The Bill Plummer saga is through. He pulled his bid to bring his building to the street and create one new home over retail and bring in another restaurant which would have been an Ippolito's. I wasn't a fan of the restaurant choice but I did like the building proposal. Frontdoor Communities is wrapping up construction on the townhomes and single family homes that make up the second phase of Providence. Take a walk down Webb St. and it's really amazing what has been done back there. The Addition of four new single family homes on Long Circle is complete and they look great. The East Roswell Library opened in 2015. It's a super nice building but I think they missed the mark by setting it behind so much parking. They should have brought it to Fouts Rd and put the parking along HBR to enhance the overall walkability and urbanism of the area. Alstead by Weiland Homes finally came to life. The original plans for the property, Centennial Walk, were much better as it was a true mixed use community but far to ambitious for that area. A proposal to put in a cottage court development on Fouts Rd next to the Twelve Stones subdivision was approved but not without a fight. This project is fantastic in my opinion as it adds a different housing stock, increases walkability around one of our city parks and creates a new city block. The Radio tower went up in East Roswell Park and people flipped out. We continue to see garbage Townhome Without A Town developments get proposed. Fortunately, two that were proposed died in 2015 but one epic fail is now under construction off Old Roswell Road. The Scott Rd project failed to get a rezoning approval but we may not have seen the end of that one. The one along Hwy 9 across from North Fulton Hospital pulled its application. However, the project that is under construction off Old Roswell Rd is the worst of the three. We saw construction start on not one but two new storage facilities. Both east and west Roswell were able to get in on the action. It was nice to see the old shopping center get a skin job and new anchor tenant. We finally received approval to extend the River Trail System all the way to the Chattahoochee Nature Center. This is an AWESOME step in the right direction. Construction on the new trail will start in 2016. 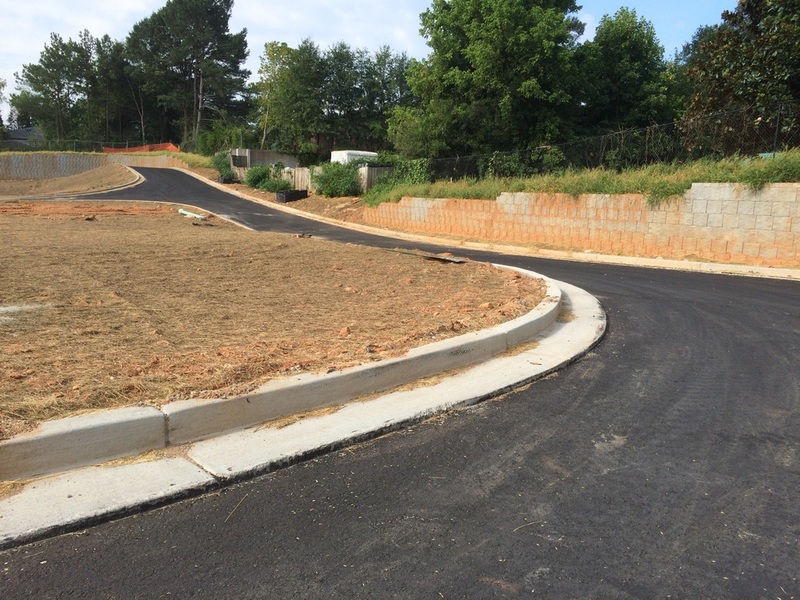 Eves Rd trail finished up and has added a much needed path along a highly trafficked road. We finally committed to honoring our commitment to GM to build the connector. Much to the chagrin of some of our avid frisbee golfers, the city made a connection to East Roswell Park from Eves Rd making it easier to drive to the facilities at ERP from Eves Rd. Given the completion of the new mixed use path along Eves Rd, I see this as yet another connectivity win. So, a lot happened in 2015 and I didn't even come close to covering everything. There will be more proposals, more transportation projects and more controversies in 2016 and New Urban Roswell will continue to keep track of what's happening. 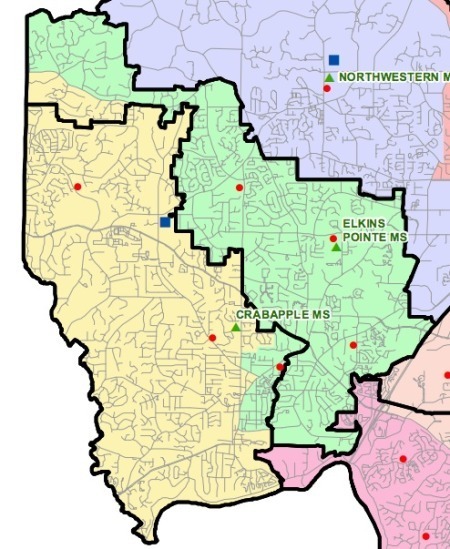 The public input process for the upcoming North Fulton school redistricting is almost over. You have until midnight tomorrow (12/14/14) to submit your comments to the county. With any school redistricting, there are going to be some PO'd people and I'm one of them. Unfortunately, our nation has a public school system that is anything other than free market and democratic. If you live in a certain spot, your children are going to a certain school regardless of whether that makes the best sense for the end consumer, end of story. The new elementary school on hwy 9 has created some pretty big shifts in Roswell at the elementary and middle school levels. High schools in Roswell are largely unchanged. 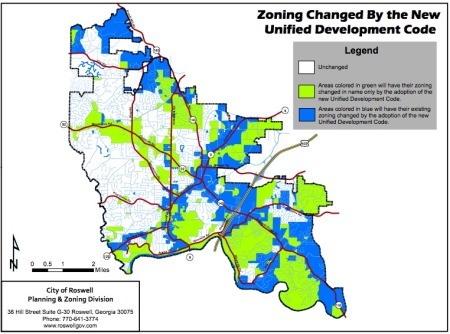 However, there are some notable shifts that will happen with elementary and middle schools on the west side of Roswell. Proposed maps for elementary and middle are below. (click on the image for the full map). Black lines show existing boundaries and colors show the proposed boundaries. 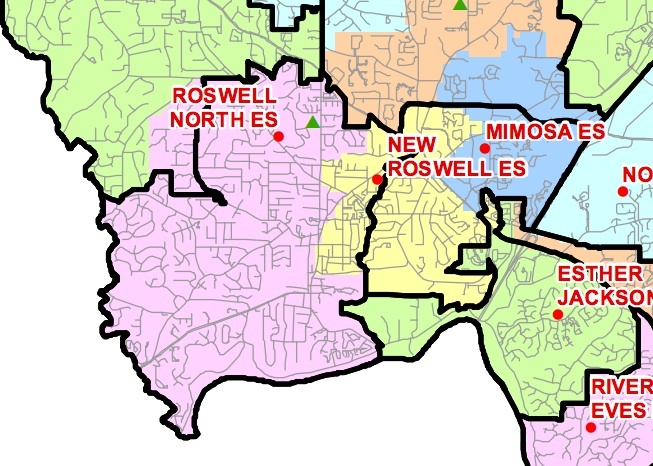 You will notice that the new school pulls from Roswell North and Mimosa primarily which was to be expected. I live in Liberty which is next door to the new school so there was no getting away from the fact that my elementary school kids would be going to the new school. What I didn't expect was to get pulled away from Crabapple Middle in the process. As the crow flies, Crabapple is right at a mile from our house and our new middle school, Elkins Point, is right at 2.5 miles. Keep supporting our car dependence for everything Fulton County. My solution.. build smaller neighborhood focused schools from elementary through high school rather than the standardized education factories we have now. Who knows, maybe another redistricting will occur before my kids are in middle school. One can dream... I'll have plenty of time when I driving to our new middle school. The planned expansion of MARTA transit into North Fulton has been floating around the news over the past couple of months. Dubbed the Connect 400 initiative by MARTA (follow the Facebook page for info), it is looking at expanding transit service north 11.9 miles from the North Springs station to Windward Parkway via either Bus Rapid Transit (BRT), Light Rail or Heavy Rail (the current MARTA rail). The overwhelming support by both residents and employees shouldn’t come as a surprise to anyone who commutes on GA400. That said, don’t view transit as a panacea for traffic problems. Transit only works properly in areas that are congested and it serves as a transportation option rather than a cure for congestion. A transit line along a non-congested corridor is doomed to fail unless there is extreme subsidy to support high ridership as motorists will always choose the easier option in the absence of financial rewards or penalties. Now that we are clear that transit will not cure congestion, let’s take a look at some of the issues and obstacles to getting MARTA rail. Route Alignment - One of the first obstacles to overcome is whether to align the route to the east or west of GA400. Through Dunwoody and Sandy Springs, the east side of the highway is lined by subdivisions and schools while the west side is mostly lined by apartments and commercial uses. My money is on a west of 400 alignment but it is a point of contention to watch. Transit Mode - The cost estimates are roughly $460M for BRT, $1.8B for light rail and $1.6B for heavy rail. You can write off light rail immediately as it is more expensive, slower and has the mode shift disadvantage. The real debate will be between the cheaper BRT and the logical heavy rail. The one thing to point out is that modal shift is a VERY difficult challenge to overcome and it will cut ridership due to unnecessary inconvenience. And before you start to balk about $1.6B, you may want to consider that the Georgia DOT is currently planning to spend just shy of $1B (one full year of DOT budget) to revamp the GA400 I-285 Interchange. That spend could become less of a need if a robust rail solution were in place for that corridor. They are obviously not mutually exclusive but which is the wiser investment for North Fulton and the region, $1B for 1 interchange ‘improvement’ or $1.6B to expand MARTA rail to Windward? Station Location - Finding the right spots for stations will prove to be a challenge. Will the stations be dedicated to parking decks or to Transit Oriented Development (TOD)? The current heavy rail alignment shows stops at Northridge, Holcomb Bridge, Mansell, North Point Mall, Haynes Bridge and Windward. No stop at Old Milton? Ahem.. AVALON? Gwinnett Tech? Will North American Properties have another massive walkable development with no direct transit connections like they have with Atlantic Station? Competition - The race for more MARTA rail may just be starting. In November, Clayton County is set to vote on whether to join Fulton and DeKalb counties as MARTA counties by opting into the penny sales tax. If this passes, they will most certainly be dreaming about rail into Clayton county and the North Fulton line would then be competing for federal funds. Don’t forget the Beltline transit initiative as well as other in-town corridors such as I20 and the Emory CDC area that are looking to get MARTA rail. There will probably be a lot of hands reaching for limited dollars. So, if we can work through these challenges, the best case scenario is a 6-12 year implementation. Realistically, if funding is secured and the project gets the green light, we might be riding trains in North Fulton by 2030 which will be around the same time that light rail is circling the city via the Beltline and potential rail will be going out to Clayton County if funding is there. So, in the next 15 years, the future is looking bright for a more transit friendly metro area where we have more mobility options than we have today. I was walking to the Roswell Farmers and Artisans Market yesterday when I came across a shiny new road sign. Regular readers know that I'm not a fan of frivolous road signs that tell us things that are either plainly obvious or completely unnecessary. This sign is one of those. New sign along Norcross St approaching Historic Rowell. I feel safer already. The fact that there is a sign here now isn't going to cause me to drive any slower. I'm going to drive at the speed the road feels safe at. As a driver on a city street, you know there are curb cuts, you know there are side roads, you know there are intersections and you drive accordingly. A sign is not going to change driver behavior. Road design changes driver behavior. If you follow the logic used for this sign to its eventual conclusion, you will have a sign for every driveway and intersection to alert unsuspecting drivers to the the chance that there are intersecitons or that other cars may be trying to access the road they are on. We have an almost perfect illustration of this right here in Historic Roswell. There are no fewer than 12 road advisory signs in a .4 mile stretch along Alpharetta Hwy right through our Historic District. Here's a collage courtesey of Google Street View. This garbage pollutes our historic corridor all the way to the River. Advisory signs are taking over our pubic realm in Historic Roswell. The only thing these signs are doing is polluting our public realm with bright shiny objects. Yes, they give some people a false sense of security that they are somehow now safer from bad drivers. News flash.. we are all 'bad drivers' at some point and signs aren't going to prevent that fact. These types of signs are meant for high speed environments that require advance notice of intersections so drivers can reduce speed and plan accordingly to make turns. Think Highway 316 to Athens or GA 400 north of the access controlled section. We don't need this type of Highway engineering in the heart of a city where speeds are 40mph or less. The public meeting for the East West Alley Master Plan is next week on 6/17. Activating our alleys is an incredibly efficient way to expand the vitality of our Canton Street area. There are numerous examples of successful alley conversions worldwide but I really like some of the concepts illustrated by the Alley Network Project. They are small tight places that make you feel cozy. They can be fantastic places for art installations. And most importantly, they enhance connectivty and thus walkability and provide opportunities for creative reuse of space. So, if you want to add more vitality around Canton Street and continue to build our downtown, try to attend. My one piece of feedback is that we need to make these the first examples of active "Shared Space" or Woonerfs in the metro area. Roswell and North Fulton have beautiful, spacious parks. We rave about the river, playgrounds and the trails. Several cities are working on new parks and squares around their city centers. It’s evident that we care about our public space. But.. we are forgetting something. We are neglecting the most abundant public space we own. We are neglecting our streets. By sheer area, our streets and roads dwarf our parks and greenspace. Some may say that our roads and streets are fantastic. They are wide, well maintained and orderly. I agree, when I have my driving blinders on but when you take a look around, you realize that once you get out of your neighborhood, you are driving on an enormous automobile sewer system. The Swiss would probably marvel at how focused our DOTs are on ensuring the streets are functional. The hierarchy of local, collector and arterial is beautiful in its logic. The potholes are usually fixed quickly and the streets are generally clean. They get paved on schedule. That said, order and proper maintenance does not build character and foster a sense of place. Our lanes are too wide, our setbacks are too far and our street trees have become glorified weeds. All of this has been done in the name of safety and standards. The roads and streets all around this country have become one gigantic aesthetic crime scene and they are only getting worse. Road signs seemingly multiply like gremlins. For goodness sake look at the number of signs adorning the historic square in Roswell. We have Tree City USA signs, Yield ahead signs, road intersection approaching signs, duplicate no left or no right turn signs and they just seem to keep coming. Cross into East Cobb from Roswell on 120 and the signs are like a heavyweight uppercut. Power lines are everywhere but at least they aren’t proliferating. Pay attention to all this incoherence and it will blow your mind. Even policies that are supposed to be a good thing have become victims of over engineering and an inflexible focus on ensuring standards are upheld rather than ensuring that the design is contextually appropriate. Who hasn’t seen a bike lane that abuts a 45 mph road? How about the fact that every turn lane off a state highway will now have at least one and usually two no parking signs. I love the two no parking signs on the southbound on ramp to 400 from Haynes Bridge. What about the fact that just before almost EVERY intersection you now see a big yellow sign telling you that that intersection is approaching. EVEN WHEN IT IS IN PLAIN SIGHT! Worst of all, we have no idea what the difference between a road and a street is anymore. Streets capture value and roads get you from place to place quickly but what we have created across much of suburbia is a nasty STROAD hybrid that does neither well. We need to start capturing value with our streets again. The people who built Canton Street knew how to do exactly that and they did it before zoning codes and red tape. It’s the most well known street in North Fulton and the great part of it isn’t even a half mile. Canton St didn’t become great because of wide lanes, road signs or bike lanes. It’s great for many reasons but the narrow lanes, sidewalks and shorter building setbacks create a sense of place like an outdoor room that people in cars, on bikes or on foot just feel comfortable in. Our focus on wide lanes, road signs, and tiny street trees is a crime committed against our places and ultimately against ourselves. Our streets should be places, not sewers. Our streets should have an overabundance of art, not an overabundance of signs. Our streets should make us want to get out of our cars and enjoy the place that they shape. The Roswell DOT released a traffic visualization earlier this week that gives a glimpse into what a future Big Creek Parkway might look like. I'm a proponent of this as it increases connectivity and will help reduce traffic cross the Holcomb Bridge / GA400 bridge.